Thank you for viewing at this SEEC product. The SIGNIFY-LA2 signal driver design has high precision with an outstanding performance, especially designed for the reproduction of music for professional and semi professional users as a converter from low and mid/low output impedances to a output impedance of 75 Ohm, and embodies pure listening pleasure. To avoid problems with signal transport, cable reflection and phaseshifting inherent to this "new" standard found a fundamental solution. * The new 75 Ohm interconnection method applied at this signal driver, has now solved most of all these problems. In combination with SEEC equipment this improvement will come to its full performance, to serve the spoiled music lovers. Speaking in terms of music: A level of dynamics, dimensionality thrue detail and clarity that are immediately appreciated. Superb high detail and articulation at low levels. 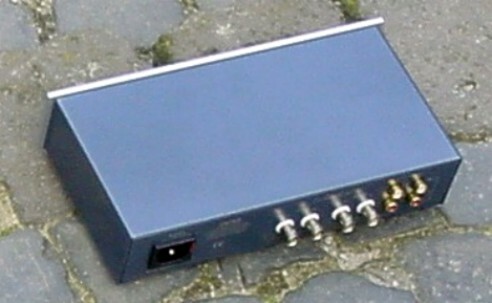 In addition to the RCA inputjacks, to convert to 75 Ohm with existing preamplifiers in combynation with SEEC MEDIATOR power amplifiers, it has the unique SEEC 75 Ohm "in" and "output" combination to overbridge long distances. With the use of SEEC 75 Ohm coaxial interlinks for example 1 or 25 meter length, (82 feet) the high signal quality will still be guaranteed. This is easy audible by a natural well balanced precise stereo impression, and extreme homogenous sound. Great effort is put in the elimination of hum and noise. The main power supply contains 10000 uF capacitors with very low inner resistance. The SIGNIFY-LA2 is a precision instrument to which nothing is left over to a coincidence. The electronic circuits consists of one integrated module to avoid, where possible, contactbridges. This type connector in combination with the right cable is used in the SEEC 75 Ohm system to drive the ultra detailed audio signals. Also used in high frequency technology to aviod tedious reflections. Especially lovers of classical music will have the essence and full advantage of this superb system.